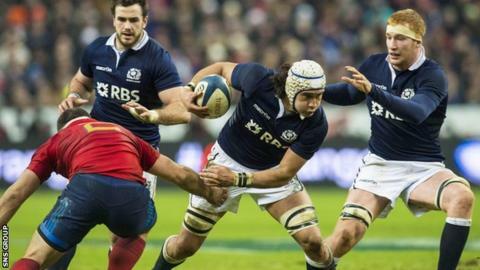 For a first showing of the Six Nations and first game together since November, there will be much that Scotland will be pleased with. But there are also plenty of things that can be improved upon after the 15-8 loss to France without too much of an issue in preparation for the reception of Wales next week. The non-negotiables such as work-rate, intensity and shape were all evident throughout in Paris but little things that make a big difference at international level were missing at times. The difference is in the detail, and some of that detail was missing in the Stade de France. When decoys are employed, they must be genuine options and must make the defence, at the very least, check their run. Twice, Scotland attempted a play from a driving maul where scrum-half Greig Laidlaw began a lateral run with blindside winger dropping underneath on the switch option, inside centre coming as the short, direct option and fly-half Finn Russell the wide option in behind the inside centre. The idea is to hold the inside defence with the winger, hold the defensive 10/12 with the short runner and then use the width. On both occasions the blindside winger was too flat and on top of Laidlaw, almost past him by the time he got into stride and the knock on affect is that the two French forwards standing out of the maul are not detached from the rest of the defensive line, allowing them to drift with the rest of the defence. The running line from Laidlaw in my opinion is too lateral and not positive enough to challenge the line and make them sit on their heels. The French, like Stewarts Melville U13s, were able to defend it comfortably since they didn't have to make any decisions. They just let it unfold and made their tackles. When Scotland got it right, we saw positive outcomes. Prop Alistair Dickinson's short, aggressive line off Russell in the lead up to Dougie Fife's try created the dog leg in the French defence, momentarily checking Pascal Pape's line, which ultimately created the corridor of space to attack. Another interesting aspect of the game was at the line-outs. Most teams function in a way that has a set movement pre-prescribed before the line-out forms and then a cancel call triggered by a code word for an alternative option should the first option be marked up. France had obviously identified the Scottish calling system and believed that their trigger calls were 'yes' and 'no'. To confuse matters, the French forwards, during the line-out were shouting 'yes' and 'no' to try and disrupt the process. Their Glaswegian pronunciation needs some work, but nonetheless it was an interesting ploy. Bizarrely, I'm sure I heard Jim Hamilton shout 'allez, allez' at the formation of one Scottish maul, but maybe I'm just hearing things. There were some outstanding individual performances from Scotland. Mark Bennett looked very dangerous when he had the ball and his two incisions were critical to the try. The initial dummy, break and off-load will probably catch the headlines but I loved the second touch before Euan Murray put in Fife. Finn Russell unleashed a huge pass off his left hand and Bennett very cleverly beat Fofana before he even got the ball in his hands by drifting off the pass, leaving Fofana to eat dirt. It was a moment of pure class. Yes, there were a couple of errors too, but you need players like Hogg to crack defences and remember at 22 years old he's still learning. I thought Blair Cowan was instrumental at the breakdown. He was causing chaos, had a couple of fantastic turnovers and is really thriving in the international environment. A good first hit out then, but now there are matches to be won.